The 15th Polish Senior Knockdown OYAMA Karate Championships and All-Polish Senior Oyama Karate Tournament in Semi-knockdown took place in Wadowice. The tournaments were organized by Małopolski Karate Club and its leader Sensei Jacek Kasperek 3rd dan. The championships were held under the patronage of local authorities and Hanshi Jan Dyduch 8th dan, the president of OYAMA Polish Karate Federation. Shihan Andrzej Pierzchała 5th dan OYAMA IKF director of schooling divisionwas also present during the competition. Sensei Paweł Pajdak 4th dan was the head referee. 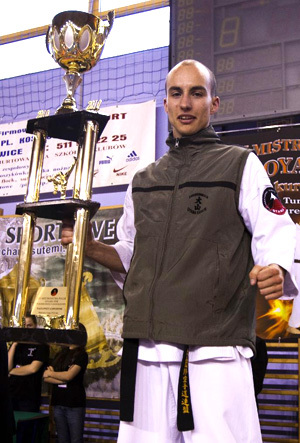 90 male and female fighters took part in the championships. They represented 22 leading clubs of: Oyama Karate and Kyokushinkai-Tezuka. The duties of the mat referees were fulfilled by Shihan Eugeniusz Stanislawek 5th dan and Sensei: Witold Choiński 4th dan, Rafał Majda 4th dan and Robert Bretner 3rd dan. The Championships were at very good sports level with their excitingand balanced final fights. Many of them ended with the verdict based on: tameshiwarii test or weight difference. 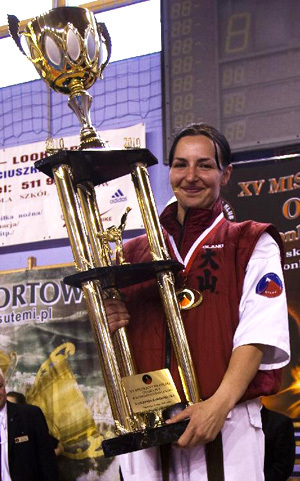 The Cups for the Best Fighters of the Championships were won by Anna Jermaków from Krakow and Łukasz Światowski from Chrzanów. Hanshi Jan Dyduch, on behalf of OYAMA Polish Karate Federation handed impressive medals, cups and diplomas.